Smoke could be seen from miles away after a fire broke out at the Kasai automotive parts plant. An Alabama auto parts maker is in the process of recovering from a fire that started off as a “water flow” alarm. 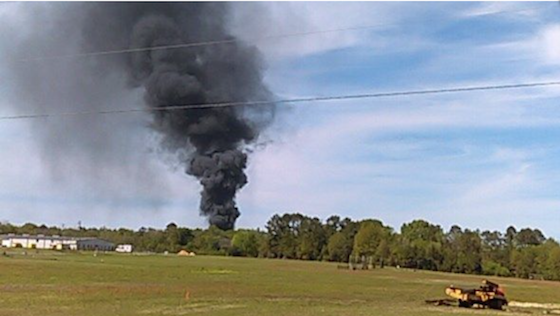 Firefighters in Prattville, AL, brought the large fire under control at the Kasai automotive parts plant. Thick, black smoke rose above the Kasai plant on Doster Industrial Boulevard around 2:30 p.m. March 31. The initial call to the Prattville Fire Department was a “water flow” alarm. When the first wave of firefighters arrived, they quickly realized it had become a fully involved blaze. They immediately called for backup. It turned out the storage room of the Kasai plant caught on fire, burning plastics and wooden pellets. It took firefighters about 30 minutes to bring the blaze under control. More than 20 firefighters responded. “The fire had spread to a section of the woods just adjacent to the raw storage area. There was a lot of smoke in the main manufacturing facility itself. However, at this time it appears it’s only smoke damage,” said Prattville Fire Deputy Chief Michael Whaley. The Kasai company is an automotive parts company that works with Nissan. No one suffered an injury in the blaze. Whaley said the plant is closed on weekends.